The following WIC Offices are open Saturday April 20 and April 27 from 9:00 am – 2:15 pm. 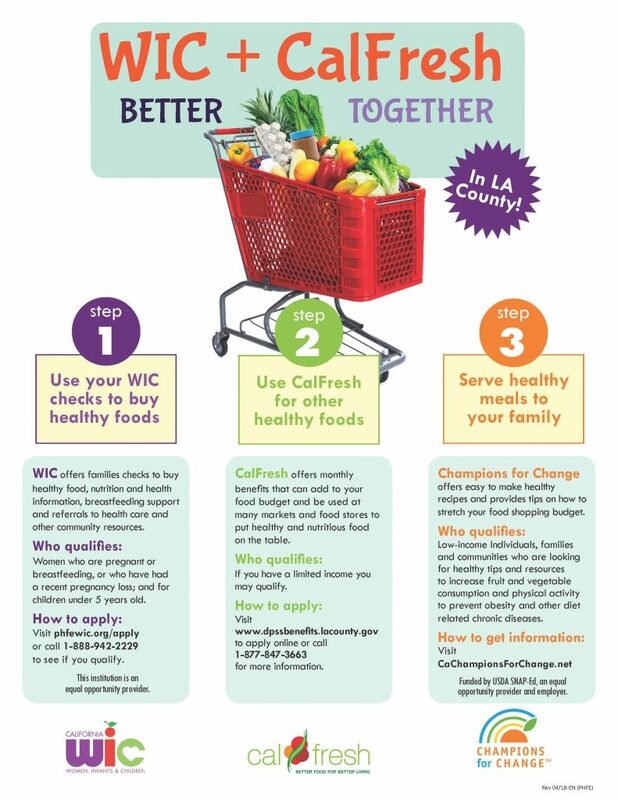 Save your cash for household expenses and use WIC and CalFresh for groceries by adding food dollars to your budget! Click here to see where CalFresh enrollment services are available near you. Have you earned more than you think? 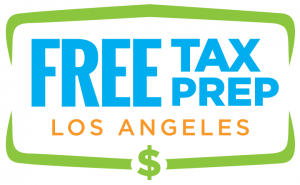 File your taxes for FREE and claim the Earned Income Tax Credit and Child Tax Credit. Need help? Go to www.eitcoutreach.org/help or call the IRS at 1-800-829-1040. The Volunteer Income Tax Assistance program can help you file your taxes for free! Click here for VITA locations in Los Angeles county. How you feel is just as important to your health as what you eat. While pregnancy is often the happiest time of many women’s lives, others find themselves feeling overwhelmed, stressed, or sad. All of these feelings are normal. It is also normal to feel no sadness or depression with one pregnancy, and then feel it with the next pregnancy. Every pregnancy is different. Here are some tips to feel better and manage your emotions during pregnancy. Changing to a different sleeping position can help us fall and stay asleep. As we lose sleep, many of us feel sadder, grouchy and are generally not ourselves. Surprisingly, getting up and moving can help give us more energy. If you are not on bedrest and your doctor says it is okay to exercise, gentle exercise such as walking or yoga can help. With any exercise, please listen to your body and do what is comfortable. Hydration and proper nutrition are also key. Dehydration can masquerade as hunger and sleepiness. Try adding drinking water throughout the day. Healthy foods with fiber, vitamins and minerals give us energy throughout the day. Sugary foods give us quick energy that will leave us wanting a nap. Sadness, also called the “baby blues”, can occur both during and after pregnancy. This can be a strange feeling if you have never experienced sadness or depression before and can be an unwelcomed guest if you have. Journaling and keeping track of how you feel can help you see your changing emotions. If you note that you are feeling down, depressed, or hopeless 3 days per week, it is time to speak to your doctor. Do not be afraid to tell your doctor about how you are feeling. Talking to family and friends can be helpful, and it’s great to have a strong support system, but talking with an expert can give you some reliable tools to help. Some women find counseling helpful during their pregnancy because they can speak with an expert who is familiar with prenatal and postpartum depression. Self-care is any activity that you do deliberately to take care of your mental, physical, and emotional health. This can be journaling, cooking a healthy meal, gentle exercise, coloring, singing, or spending time with a pet. Self-care doesn’t have to cost anything at all! You may experience sadness, mood swings, difficulty concentrating, lack of interest in things you used to enjoy, nervousness, anxiety and more. Symptoms can appear any time during pregnancy and up to the child’s first year of age. You did nothing to cause this. The sooner you get treatment, the better. There is help for you. Talk to your doctor and WIC about how you are feeling, or contact Postpartum Support International @ 1-800-944-4773 or www.postpartum.net. Emotions During Pregnancy is the prenatal health topic of the month at PHFE WIC. For more education topics, visit www.WICOnlineEducation.org. CinnaMoms breastfeeding support groups provide a safe space to discuss life, health, and breastfeeding while breaking down barriers and proving that #BlackWomenDoBreastfeed! CinnaMoms gather to form a network of support for each other. We encourage pregnant and breastfeeding women to bring the whole village – CinnaDads, CinnaGrands, CinnaBabies and CinnaKids to all of our events. We host our support groups in five WIC centers that have a high population of African American families. Every day we make a commitment to advocate, encourage, and lend a pair of listening ears to our community. CinnaMoms goes beyond our regular WIC services by providing a safe space to chat about historical feeding practices, cultural perceptions of breastfeeding, familial feeding experiences, and the health benefits of breastfeeding. We discuss interesting and edgy topics that spark conversations about maternal and postpartum health, support systems, and cultural beliefs while enjoying nourishing snacks and many laughs. To learn more and RSVP for a support group, visit www.CinnaMoms.org. For more breastfeeding support groups information, ask your local WIC office. Yes! Men are welcome at WIC. WIC recognizes the important role that fathers, grandfathers, stepfathers, and other guardians play in caring for kids. Fathers and other caregivers of kids under five are encouraged to enroll and bring kids to appointments, attend nutrition and health education sessions, and use their checks in grocery stores that accept WIC. 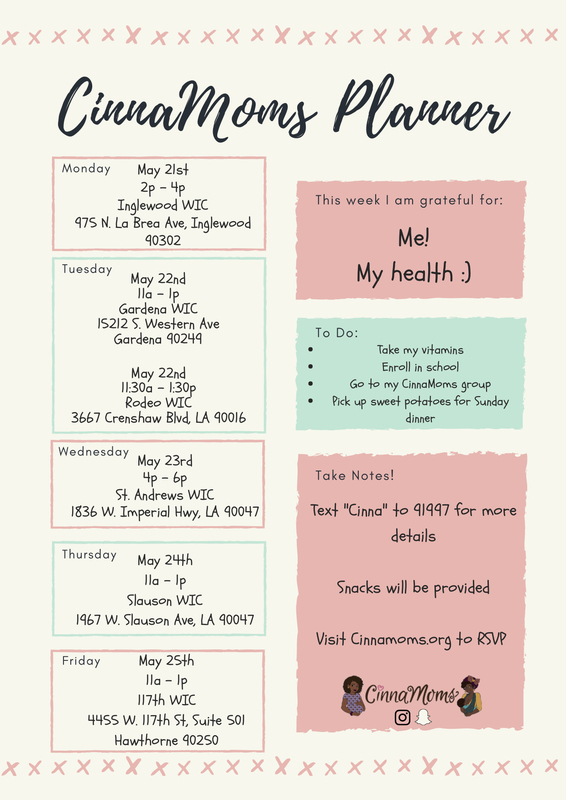 CinnaMoms Breastfeeding Support Groups in March! Posted on September 12, 2017 | by Kelly Van Hill | Leave a Comment on CinnaMoms Breastfeeding Support Groups in March! Can Men Participate in WIC? Posted on September 12, 2017 | by Kelly Van Hill | Leave a Comment on Can Men Participate in WIC? Farmers’ Market Program Coming Soon! WIC is excited to invite you to our prenatal discussions during your WIC appointments! Use your WIC Farmers’ Market checks today! CinnaMoms Celebrating Black Breasfeeding Week! WIC wraps up another successful Farmers’ Market season! WIC Celebrates World Breastfeeding Week! Have you been affected by a wildfire?